Sign up now to stay in the know with the latest news and exclusive offers delivered right to your inbox! Intended for US residents only. For more information, please review our Privacy Statement. 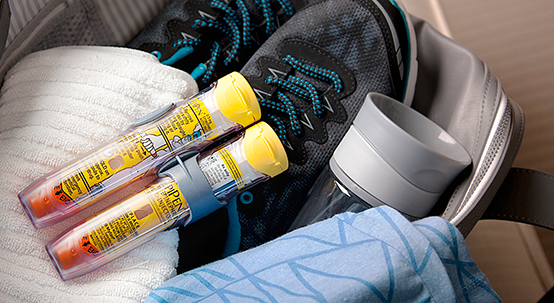 Mylan offers saving programs for EpiPen® Auto-Injector and its authorized generic. Explore below to find the right program for you. The My EpiPen Savings Card® can provide you up to $300 in savings* for each EpiPen 2-Pak® carton per prescription refill. You can print the savings offer from your computer or store it on your smartphone and present it to your pharmacist. The My EpiPen Savings Card® helps eligible patients who have commercial health insurance save on out-of-pocket costs. Just present your card at the pharmacy each time you drop off or refill your prescription.The My EpiPen Savings Card® is reusable for up to six EpiPen 2-Pak® cartons so you can have EpiPen® Auto-Injectors available in different locations. Mylan’s MyGenericEAI Savings Card can provide you up to $25 in savings* for each two-pack of Mylan's Epinephrine Injection, USP Auto-Injector (its authorized generic for EpiPen®) per prescription refill. The MyGenericEAI Savings Card helps eligible patients who have commercial health insurance save on out-of-pocket costs. You can print the savings offer from your computer or store it on your smartphone. Just present your card at the pharmacy each time you drop off or refill your prescription. Mylan's MyGenericEAI Savings Card is reusable for up to three (3) two-packs of Mylan’s Epinephrine Injection, USP Auto-Injector so you can have epinephrine auto-injectors available in different locations. *Eligibility restrictions apply. See full Terms and Conditions for My EpiPen Savings Card®here and MyGenericEAI Savings card here. These offers are not valid for patients covered by Medicare, Medicaid or any other federal or state funded healthcare program or where prohibited by law. Mylan Specialty L.P. reserves the right to amend or end this program at any time without notice. Are you eligible for Mylan’s Patient Assistance Program? Mylan has enhanced its Patient Assistance Program to help increase access to EpiPen®. To enroll, patients must complete the Patient Assistance Program form with their physician. Patients can obtain additional information on the program by emailing customer.service@mylan.com or calling Mylan Customer Relations at 1-800-395-3376 to speak with a representative. The patient must be a US citizen or a legal resident living in the United States. The patient's gross yearly household income must fall below 400% of the current federal poverty guidelines, based upon family size. Verification documents will be required. Approved documents: 1040, 1040ez, W2, 4506-T, SSI Statement, Disability Statement, Statement from Physician, Nurse, or Patient Advocate, or Certified Notarized Statement from the Applicant. The patient must not have prescription insurance coverage through Medicaid, Medicare Part D, TriCare, a qualified health plan purchased on a state-based, partnership, or federally facilitated exchange, or any other public or private program or insurer. Verification documents will be required. Approved Documents: Denial Letter, Termination Statement, Statement from Physician, Nurse, or Patient Advocate, or Certified Notarized Statement from the Applicant. The patient has commercial prescription drug coverage only for generic products and the patient must not have prescription insurance coverage through any state or federally funded program, including, without limitation, Medicare, Medicaid, TriCare or Medicare Part D. Verification documents will be required. Approved Documents: Denial Letter, Termination Statement, Statement from Physician or Nurse, or Verification of Applicant's Coverage from the Insurer. Is your school eligible to participate in the EpiPen4Schools® program? With the EpiPen4Schools® program, Mylan Specialty L.P. offers four free EpiPen® or EpiPen Jr®(epinephrine injection, USP) Auto-Injectors, upon qualification, which includes having a valid prescription, to public and private kindergarten, elementary, middle and high schools in the US. To participate in EpiPen4Schools®, a school nurse or other authorized school representative must visit www.EpiPen4Schools.com to download the order and certification form, and then fax or email the form with a valid prescription to 1-973-718-4328 or info@bioridgepharma.com. Alternatively, school representatives can call 1-973-845-7600 to speak with a live representative. There is no requirement for a school to purchase additional EpiPen® Auto-Injectors or any other Mylan Specialty products.